So I blindfolded my monkey, spun him around 5.7 times,* and had him throw some darts. Which is to say I revved up the JB/OTE forecasting models. I’m getting about 90K on payrolls which is a little below the consensus of 100K (110K for private, implying continued loss of public sector jobs). The US stock market liked the ADP jobs number — 163K in the private sector. The ADP is a private payroll processing firm that derives their own estimate of national payrolls, sans the gov’t sector. Though the ADP and the BLS data track each other very closely — correlations between levels and changes are above 0.95 — you can’t reliably go from ADP on Wednesday to BLS on Friday. And lately the ADP has been a bit bullish relative to the BLS — not that 160+K is such a great number, btw — it’s slightly north of what we need to tread water on the jobless rate. 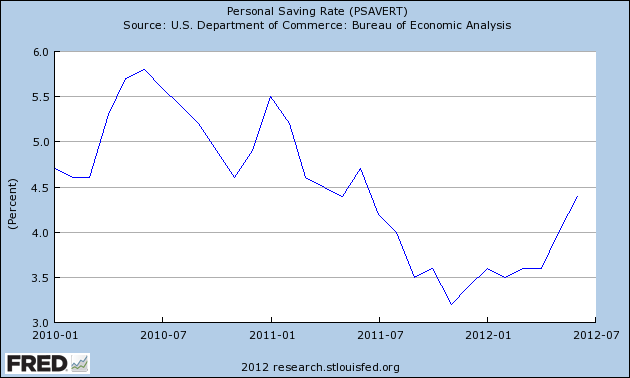 Other factors that would lead you to come in closer to consensus are the slowdown in real GDP in the second quarter and the recent growth in the savings rate (see figure). Consumer retrenchment ain’t exactly what the doctor ordered for the job market right now. So, I hope we’re closer to ADP than consensus but I wouldn’t bet it. *that’s the natural log of the year/month: ln(2012/7)…duh. Share the post "Jobs Day is a Comin’…"
5 comments in reply to "Jobs Day is a Comin’…"
Thanks, Jared, for keeping a geeky sense of humor amidst all the sometimes depressing news that you report on (see, e.g., Edward DeMarco, fiscal cliff, etc.) Just wanted to let you know that your careful analysis, loaded with math and CHARTS–yay!–are very much appreciated! Does your 90k prediction take into account the decrease in rail-transported garbage? I’ve been curious how you think strange seasonality patterns (e.g. warm winter, auto workers staying on longer) are playing in role in the up and down numbers we’re seeing over the first half of the year? I think the consensus is that unusual seasonality added some jobs that weren’t really there in the winter and perhaps subtracted some in the spring but that these things balance out and don’t change the larger story.